The United States in late 1941 established a secret program, which came to be known as the Manhattan Project, to develop an atomic bomb, a powerful explosive nuclear weapon. The aim of the project, directed by physicist J. Robert Oppenheimer, was to build an atom bomb before Germany did. 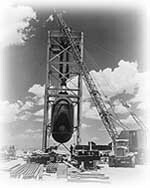 On July 16, 1945, in the New Mexico desert, the first atomic device was tested. On August 6, 1945, the first atomic bomb attack occurred over Hiroshima, Japan. Three days later, Nagasaki, Japan was bombed. On August 15, 1945, World War II ended with the surrender of the Japanese. On October 15, 1962, the Soviet Union was discovered attempting to install nuclear missiles in Cuba. These missiles would have been capable of quickly reaching the United States. President Kennedy responded with a naval blockade. After several days of increasing tensions, the Soviet Union finally agreed to remove the missiles. In the spring of 1963 the U.S. quietly removed the missiles from Turkey, that equally threatened the Soviet Union. This crisis is regarded as the closest the world has come to a nuclear exchange. "Nothing could have been more obvious to the people of the early twentieth century than the rapidity with which war was becoming impossible. And as certainly they did not see it. They did not see it until the atomic bombs burst in their fumbling hands." "Lord, we are especially thankful for nuclear power, the cleanest, safest energy source there is. Except for solar, which is just a pipe dream."